Ronnie has been commissioned to sculpt both personal and commercial sculptures for the last twenty years. She is also an excellent painter and many of her paintings are in homes and businesses throughout the United States. By owning her own foundry, her commission fees are often lower than others, as she can eliminate the “middle man”. Owning her own foundry also enables her to take an active roll in each part of the casting process. Examples of her work are illustrated below. 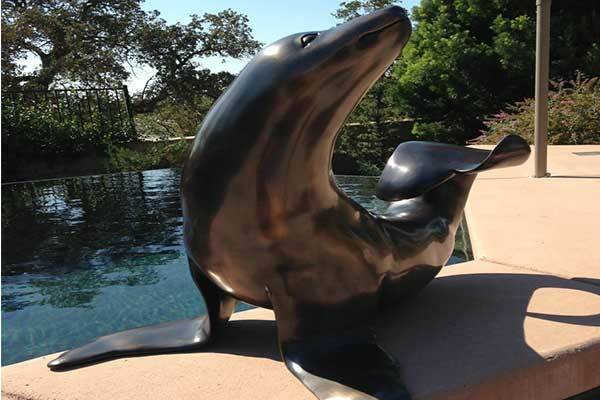 You may contact her through the foundry phone number, (916) 929-5225 if you are interested in discussing any type of art that you have in mind. 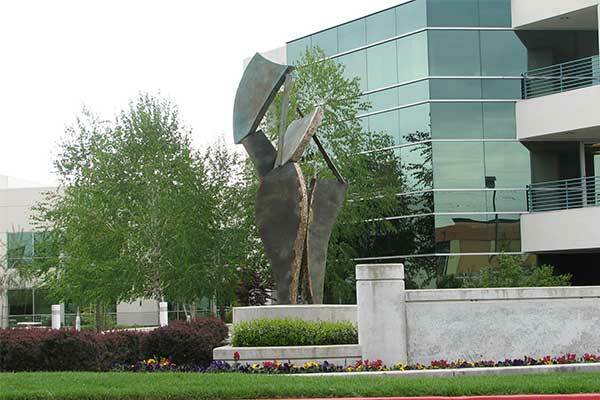 This sixteen-foot sculpture was installed in 2012 on Eureka Road in Roseville, California. It is a contemporary piece that is illuminated with uplighting at night. 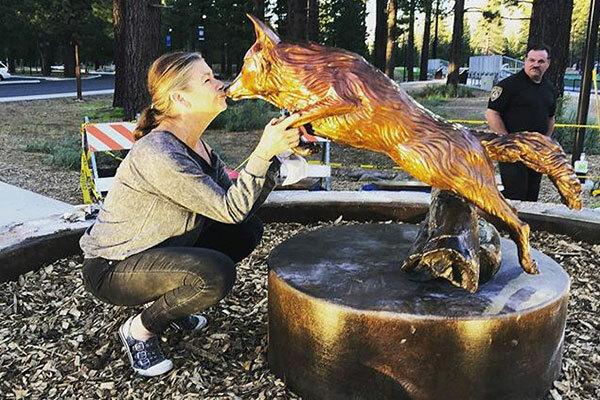 This realistic Sierra-type coyote is installed at Lake Tahoe Community College in South Shore Lake Tahoe. Ronnie was selected by a college committee for the commission. The coyote is the school’s mascot. A dentist in the Bay Area of California could not remember his father who was lost fighting for the South Viet Nam army when the dentist was a baby. Ronnie was commissioned by the family to sculpt the father Henry from photos furnished by the family. The dentist wanted to finally “touch” his father, so Ronnie took an impression of the dentist’s hand (see Whole Lotta Love), cast the hand in bronze separately, and attached the hand to his father’s face. 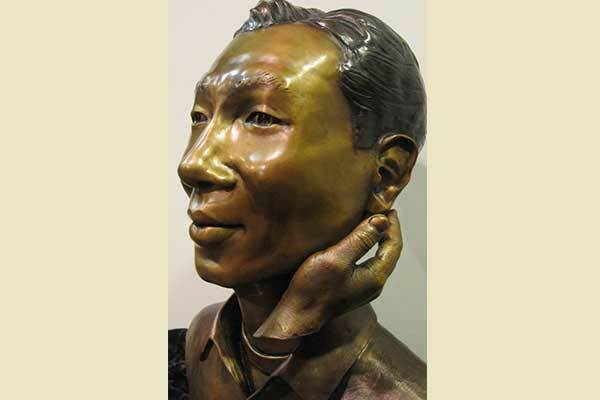 Ronnie was commissioned by the Placer County Chapter of the Japanese American citizens League and Placer County in 2012 to sculpt a larger-than-life size piece for the Bill Santucci Justice Center in Roseville, California. 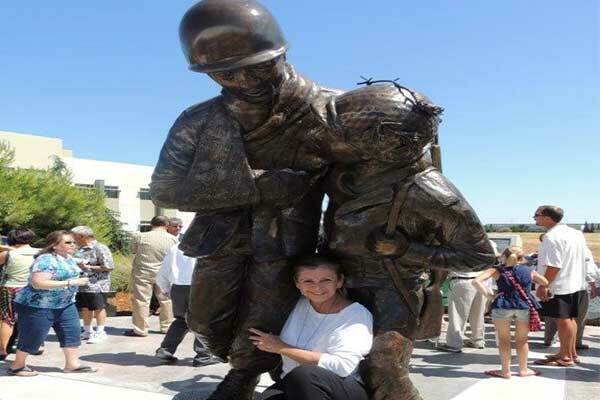 The sculpture depicts the 442nd Regimental Combat Team of WWII made up largely of Japanese American soldiers rescuing the 141st Texas Regiment. The 442nd Regiment is the most decorated combat team of its size in US Army history. 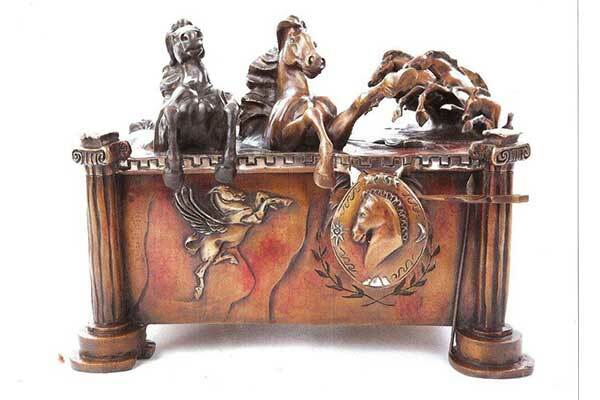 Sculpture box was sculpted by Ronnie. 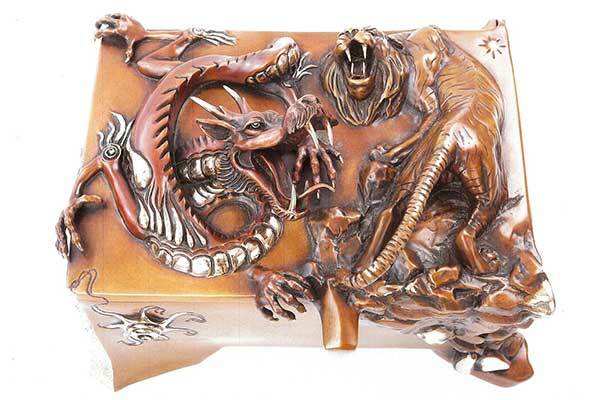 She was commissioned by a pen collector to create storage boxes for high-end pen collectors but have also been used as a safe and as an urn. They are limited editions and can be purchased through Frostad Atelier. 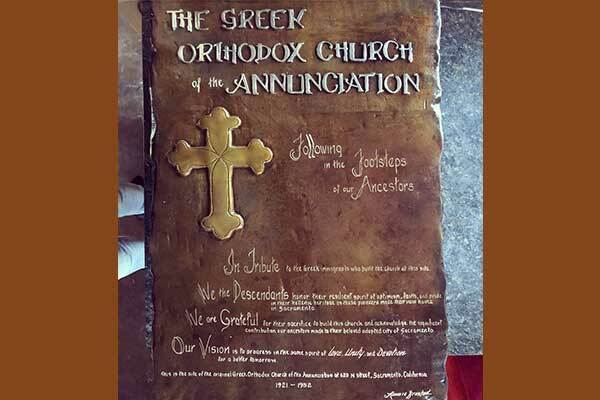 In Sacramento commissioned Ronnie to sculpt a bas relief in memory of the original Greek Orthodox Church and a model of the original church. 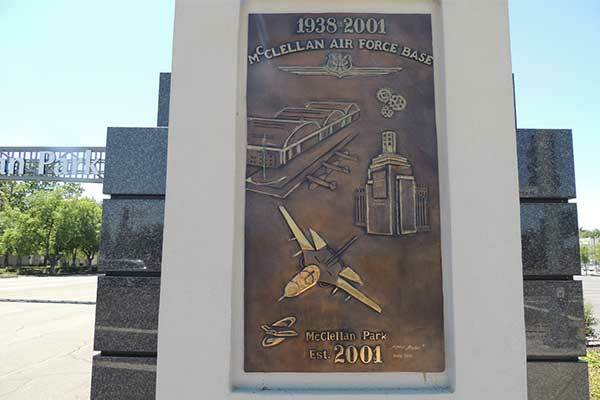 Is a large bronze relief at the entrance of the closed McClellan Air Force Base in Sacramento, California. Ronnie was commissioned to sculpt and install the sculpture by the management of the now business park. Is located in Barrel House Restaurant in Sausalito, California. Ronnie was commissioned by the owner of the restaurant to sculp this seal, bronze straps for the ceiling like the inside of a barrel, and the front door of the restaurant. Ronnie has many more commissioned sculptures in her portfolio such as the “Sea Creatures” located in Rincon Park, Sausalito and fish embedded in the floor of refurbished Fisherman’s Grotto in San Francisco and a large octopus on the stairway of the restaurant.